We adore the flurry of flowers and butterflies within the Belle and Boo collection and Katie takes us step by step to layer the coordinating papers and to add the sweetest decoration that will perfectly frame your chosen photo/s! 1.Begin by taking the nylon brush from the First Edition Brush set, paint your A4 clipboard with the DecoArt Chalky Finish paint- Everlasting and leave to dry. Next, cover the board with a layer or First Edition Deco Mache Crackle Top and base coat following the instructions on the bottle. 2.Paint a layer of DecoArt Chalky Finish paint- Timeless across your clipboard and leave to dry. The crackle effect that you applied previously will give your layout a vintage feel! 3.Take the glittered floral sheet from the Belle and Boo 12x12 paper pack, cut a 27cmx19cm rectangle and distress the edges. Cut a Dovecraft Serendipity doily in half and glue one half to the bottom right of your clipboard, then layer your Belle and Boo sheet on top, ensuring that it is glued to the centre of your layout. 4.Cut a 24.5cmx17cm rectangle from a patterned piece of paper from the Belle and Boo 12x12 paper pack, distress the edges and glue it on your first sheet, level with the top of the previous sheet. 5.Next, take the glittered butterfly sheet from the Belle and Boo 12x12 pack, cut it down to 20cmx13.5cm and distress the edges. Glue this to the centre of your layered sheets. 6.Take your chosen 6x4 photo and cut it down to 13cmx7cm. To match the first layer, cut a 14cmx9cm rectangle of the glittered floral paper, distress the edges and adhere your image to the centre to allow room for a nice border. 7.Find the striped sheet within the Belle and Boo 8x8 paper pack, cut it down to 18.5cmx7cm and distress the edges. Glue towards the left hand side of your layered, butterfly sheet. 8.Adhere the other half of the Dovecraft Serendipity doily to the centre of the strip you just added. Cut a yellow wooden frame in half and adhere this to the bottom of your strip. 9.With strong adhesive, stick your layered photo to the top of your wooden frame. 10.Decorate your layout by gluing down the ‘Beautiful day’ stitched label, ensuring to overlap the bottom left corner of the photo. Glue two paper flowers underneath your label along with a wooden button. 11.Die cut a selection of First Edition Layered Flowers onto the Dovecraft pink and yellow glitter card. Stick a few to the bottom left corner and one to the top right of your photo. Surround these with a paper flower, a wooden button and a glitter dot in each flower. 12.Create a ribbon rosette with the Belle and Boo bunny ribbon by cutting 8x 4cm strips. Fold each in half and secure with Dovecraft Perma Fix tape. Create a flower shape by gluing each piece around the back of a wooden button to create the rosette design. Glue the finished rosette to the bottom right of the clipboard. 13.To finish, add a heart shaped wooden button to the middle of the clip. Cut a length of pink organza ribbon and create a bow. Add a glittered, layered flower to the centre and add a glitter dot to the middle. 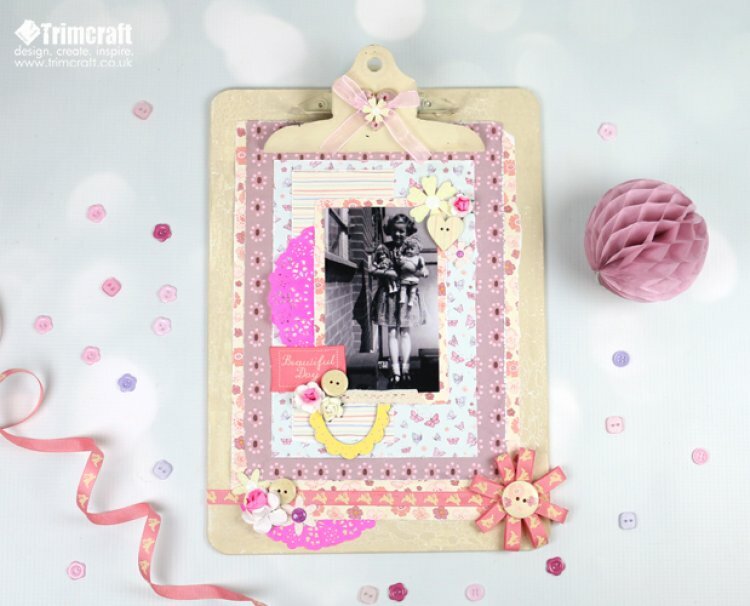 This layered scrapbook layout will be a lovely keepsake to hold onto or to give as a special gift. How will you use the Belle and Boo collection in your layout? We’d love to see your inspired makes so remember to upload your crafts to the project gallery and to #Trimcraft on social media so we can have a peek!